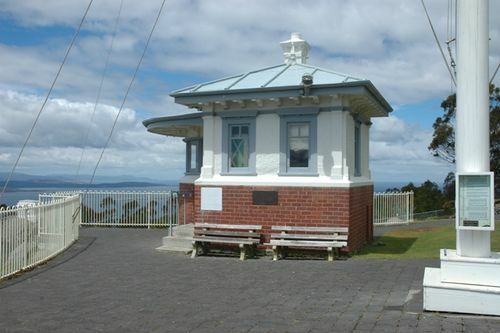 Plaque commemorates the establishment of the Mount Nelson Signal Station in 1811. The establishment of the Signal Station at Mount Nelson was ordered by General Macquarie in 1811 during his tour of Van Diemen`s Land. He specified that the station was to consist of a mast and barracks for a corporal`s Guard. Signalling was to be undertaken by flags. By 1860 the Mount Nelson Semaphore had grown into a two tiered structure with the top six arm semaphore dealing with the Port Arthur traffic whilst the lower dealt with the maritime traffic into Hobart. This plaque commemorates the establishment of Mount Nelson Signal Station (Named after the brigantine "Lady Nelson) by Governor Lachlan Macquarie 30th November 1811.